Here in the South, banana puddin’ (or pudding, if you’re fancy) is the nectar of the gods. If you go to any legit meat and three, it is expected that this will one of your 3 veggies. It totally counts, and you’d be a fool to not follow the tradition. Since I sometime don’t feel like leaving the comfort of my sweatpants at home, I decided to incorporate banana pudding into my own kitchen creation. It’s like dessert inception, I guess. A dessert in a dessert. I ain’t mad about it. Instead of whipping up a full on pudding, I also raised the bar… with the bar itself. Banana Pudding Whiskey Cream was the latest addition to my watering hole and it is perfect for this recipe. By now, y’all know how much of a fan of baking with booze I am. 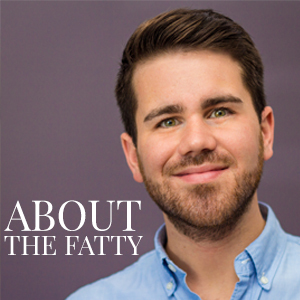 I’m considering making my first Southern Fatty cookbook all about it. — (PS – Thoughts on a SF cookbook??) — A sip for the baker, a splash for the batter. Whiskey cream has been one of my all-time favs for blending. You can almost always swap out the milk for the whiskey 1:1. That’s probably true in life in general, I think. Morning cereal? Add some whiskey cream. Monkey bread a little dry? A bit o’ boozy cream will fix that right up. 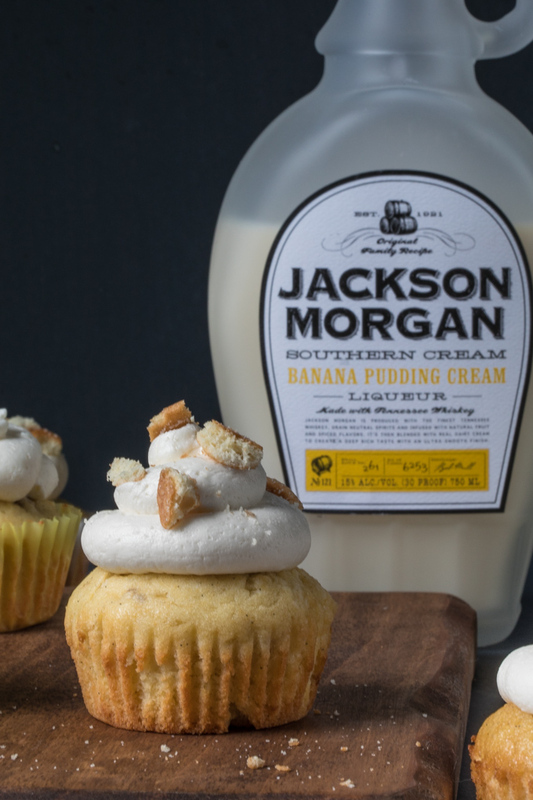 This Jackson Morgan Banana Pudding Southern Cream has become my best baking buddy in the new year for sure. I’ve made several different recipes using their products, and they are some of the best Nashville folks around. Be sure to check out the Whiskey Cream Caramel Popcorn, Boozy Root Beer Whiskey Float, and the Brown Sugar Cinnamon Whiskey Eclairs recipes while you’re browsin’. I’m doing the South proud with this one. This banana pudding is definitely meat and three worthy. 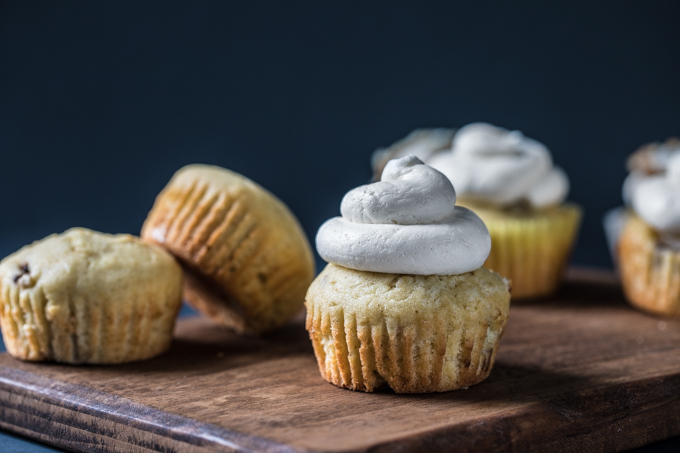 — I developed this recipe using a favorite, super-moist vanilla cupcake base that everyone should know by heart. 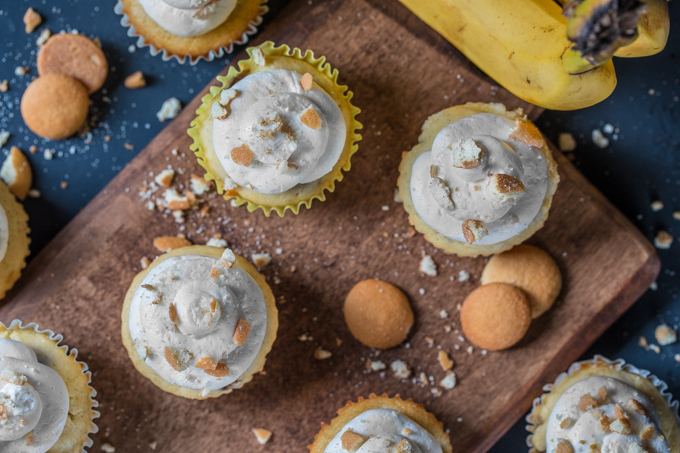 Added some chopped banana for texture, replaced the milk with whiskey cream (because, duh), and topped it all with my absolute favorite frosting recipe ever. It’s an Ermine buttercream. This is the same recipe for frosting that I used on one of our most popular blog recipe to date, Blackberry Bourbon Cupcakes. It sounds kinda odd, but it uses a baker’s roux as the base. Ermine, sometimes called boiled-milk frosting, was actually the original frosting for the infamous southern red velvet cake. Flour is cooked with whipped into a creamed butter mix. It creates a frosting that is absolutely memorizing in texture. 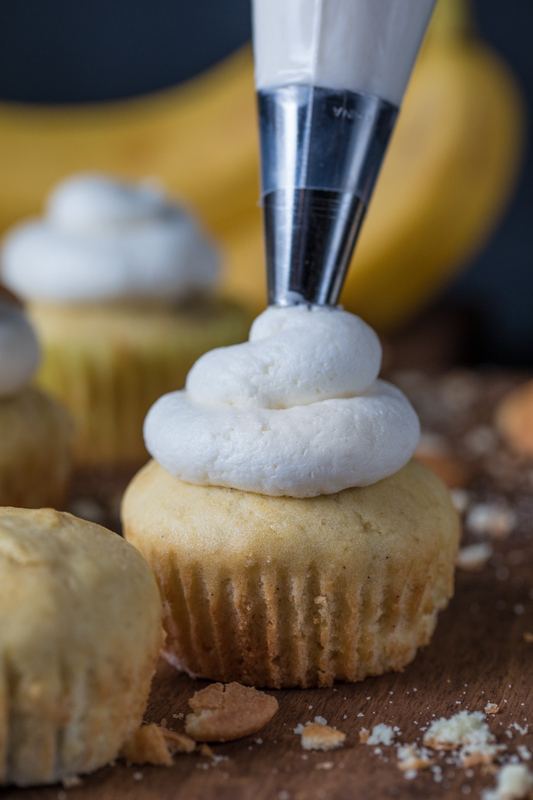 It’s the softest, lightest buttercream while still holding the richness from a great butter base. Trust me, y’all. You want to try this. You’ll never turn back. Bottoms up. Banana pudding with a lil booze for the win. 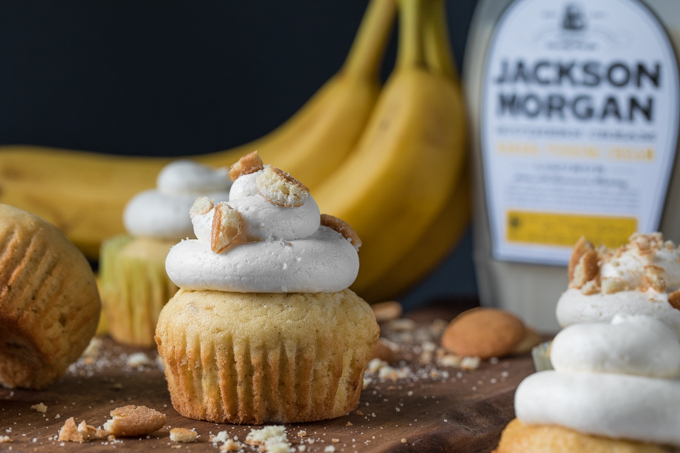 Super-moist banana cupcake made with banana pudding whiskey cream, topped with Ermine whipped buttercream with another splash of whiskey cream. From SouthernFATTY.com. Sift together dry ingredients into a bowl.Set aside. Place eggs in mixer. Mix on medium speed until well broken up. Add sugar and mix. Add vanilla and oil. Add half of dry mixture and combine. Add whiskey cream and mix completely. Add remaining dry flour mix until mixed. Do not over-mix. Fold in chopped banana pieces. Combine flour and milk in saucepan over medium heat. Whisk constantly until reduced and thick. Look for a paste-like consistency. Stop when you can see the bottom of the pan remain when stirring through mixture. Remove and cool (ok to refrigerate with plastic wrap on top to speed up). Cream butter and sugar 2-3 minutes until creamed and fluffy. Add whiskey cream and mix only until completely combined. Do not over-mix of frosting may break. Pipe frosting on cupcakes, decorate with crushed vanilla wafers. Enjoy! Visit SouthernFATTY.com to tell us how much you enjoyed them. What whiskey-infused boozy baking recipes would you love to see on the blog? Disclosure: I teamed up with Jackson Morgan to create this recipe. I appreciate your support of our partnerships with the brands we love. Hey Phillip; I think I ran into an oops situation and am looking for what I may have missed. I made my attempt at the Ermine for a lemon cake but after I added the milk mixture to the butter and sugr it came out pretty runny and almost had a grit in it but the taste was fine and everything else… I am at a loss as to what I missed, the butter was room temperature and creamed up nicely. I am curious if there was an issue with the milk and flour? I ended up taking a hand mixer to it near the end…could this have done it? Hmmmmm….. My first guess would be that the roux wasn’t cooked down enough. Was it quite thick when you removed it from the heat? Did you cool it completely before adding it to the butter? God, these are like my childhood wrapped into an boozy sweet treat. Bring these with you next time you make it to Louisville! 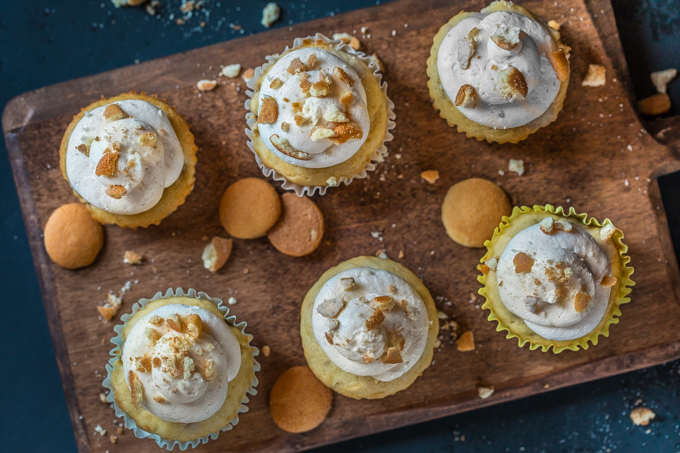 If you childhood didn’t include whiskey cupcakes, someone was doing it all wrong. LOL, I was thinking more along the lines of banana pudding. Vanilla wafers were my jam. But whiskey cupcakes as a kid are always a good idea. OHHH ya. Hah! Pudding, too.